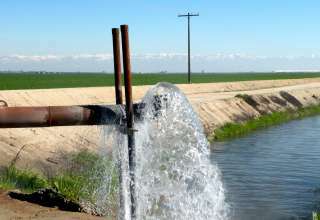 When it comes to groundwater in the Central Valley, there have been many articles lately telling part of the story but very few telling the whole story. Those articles criticize communities and farmers for pumping groundwater to supply water to their residents and to irrigate their farms. Most of the articles place the blame for groundwater pumping squarely on the shoulders of farmers and urban water users. This is only part of the story. Urban and rural communities have increased their pumping of groundwater due to 25+ years of federal and state policies that have curtailed surface water deliveries. The management of the water system has caused water users to turn more often to groundwater to compensate for the surface water shortages. And, the government is failing to operate the system as it was originally intended. Predictably, Westlands has a challenge to get the media to tell the whole story, but we will continue our efforts. We will tell the whole story about groundwater and the failure of government to develop policies that meet the water supply and environmental objectives. When we explain the current problem, we will talk about the history of the Central Valley Project (CVP), the failure of government policies, and the ramifications of those failed policies. Here’s the rest of the story. Back in the 1930’s, both Congress and California State government recognized the need to develop the CVP to increase surface water supply to serve a “multitude” of purposes, including to remediate groundwater overdraft. “Initial features of the project were built primarily to protect the Central Valley from crippling water shortages and menacing floods, but the CVP also improves Sacramento River navigation, supplies domestic and industrial water, generates electric power, conserves fish and wildlife, creates opportunities for recreation, and enhances water quality.” https://www.usbr.gov/mp/cvp/about-cvp.html Despite the original purposes, regulatory decisions along the way have systematically curtailed surface water deliveries and harmed those who built their farms and businesses around the assurances provided by the government through the construction of the CVP. The graph below clearly illustrates the correlation between the curtailment of surface water supplies and the inevitable increased reliance on groundwater. The story doesn’t end with government failing to deliver adequate quantities of surface water. Another part of the story that is often left out of news articles is the government’s rationale for withholding water supply. 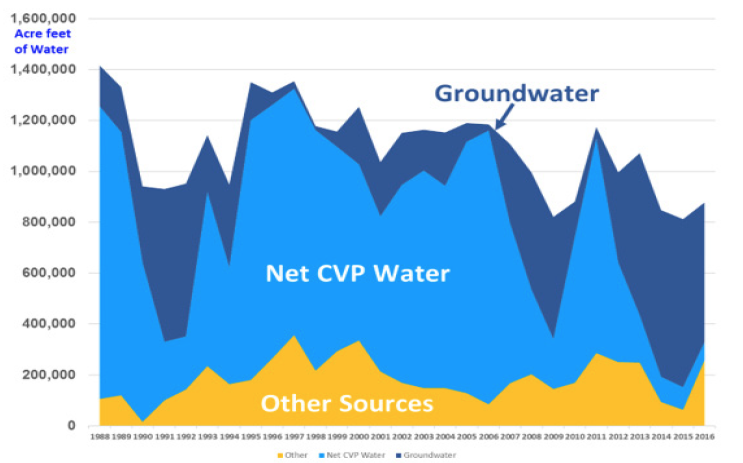 For decades, government policies focused on CVP pumping as the primary cause of the decline of fish populations. Now the rest of the story is being told. Federal and state officials, as well as academic experts, now recognize the many factors that are causing the decline in the fish population. 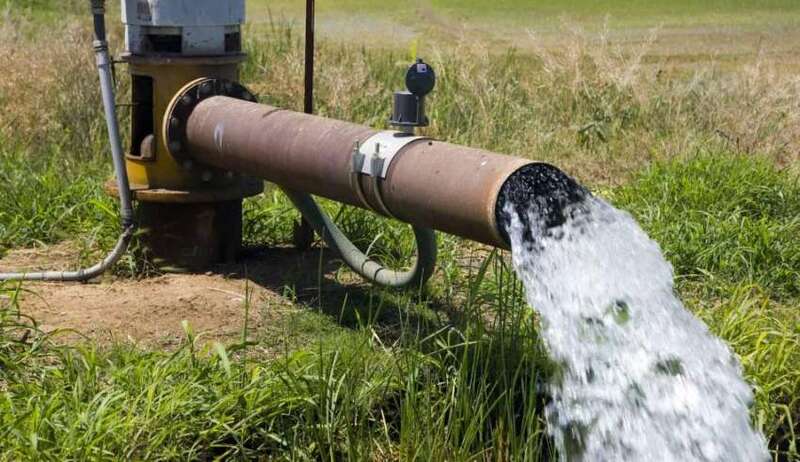 With that major admission, Westlands and others are requesting that government fulfill its CVP obligations by restoring the delivery of surface water to the farms and communities that depend on CVP water. There is a tremendous amount of fresh water that could be delivered to communities, without causing the decline of fish populations, but instead is left to flow to the ocean. Our Water Supply Update shows that California sent almost 260 billion gallons of water out to the ocean in May – some of which could have been pumped for people, cities, and farms and other areas to replenish the state’s aquifers. As the debate over groundwater continues, Westlands will continue to tell the rest of the story and confront misinformation and incomplete explanations of water supply issues that currently serve as the basis for failed federal and state policies. 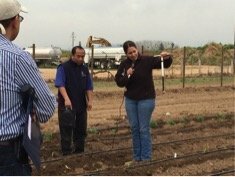 UCCE advisor Ruth Dahlquist-Willard (right) demonstrates how to evaluate soil moisture with a soil sampler. In the center is UCCE Hmong ag assistant Michael Yang. 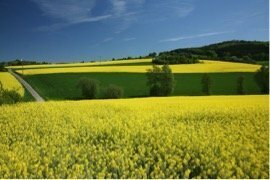 Investors, Large Land & Ag Investments.